Oh crepes, how I adore thee. We don’t get together too often because of our busy schedules, but when we do I fall in love with you all over again. You’re so soft and tender, with your delicate lacy edges. You can wrap around any filling; transforming humble cheese, meat, vegetables or fruit into an elegant yet simple meal or sweet dessert. And how easy going you are too! You can be made days in advance, refrigerated or even frozen for months at a time and still come out fantastic. You can be a little finicky at first but once I get into my crepe-making rhythm you come out perfect every time. You are so easy to get along with, being adaptable to many different flavors. You have traveled the world and made your mark in France with buckwheat flour, in Asia with rice flour, in India with fermented rice and lentils, and in Ethiopia with fermented teff flour- not to mention your countless cousins in almost every culture known to man. I thoroughly enjoyed our most recent rendezvous in Southeast Asia. You were pleasantly chewy from glutinous rice flour and lightly sweetened with the scent of rich coconut and bright yellow turmeric. Boy, were you were a sight to be seen; paired with creamy banana and spicy Altaulfo mango and topped with more coconut milk and cinnamon, I’ll never forget you. I know I say this every time, but we should definitely get together more often. This is a great recipe to make ahead. 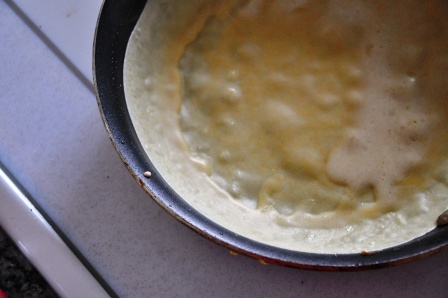 The batter can be made up to three days in advance, as can the crepes. If making the crepes ahead of time, put a layer of plastic wrap, parchment, or waxed paper in between them so they don’t stick together. 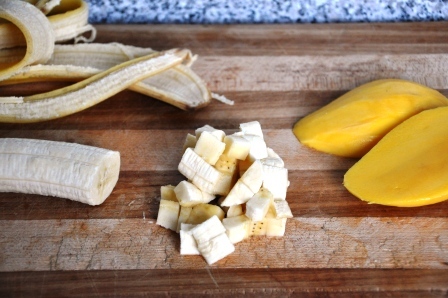 The only thing that needs to be done at the last minute is to cut the banana, as they do oxidize rather quickly. Do not use light (or “lite”) coconut milk in this recipe! Light coconut milk is just coconut milk with water added, so save yourself some money and buy regular coconut milk thinning it with water if you so desire. Also, if you can find Chaokoh Thai coconut milk you should use it as it is richer and thicker than other coconut milks. Make the crepe batter. 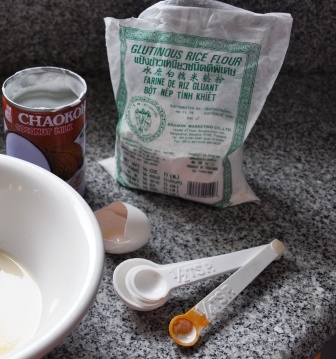 In a medium bowl, whisk together the flours, salt, turmeric, sugar, egg, coconut milk, and water to form a thin batter. Let the batter rest for 30 mintues. Make the crepes. Heat a small nonstick skillet over medium heat, then coat with nonstick cooking spray or brush with a tiny amount of vegetable oil. 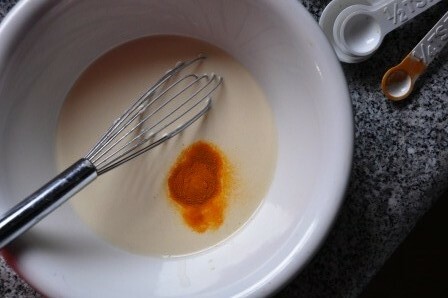 Pour a scant ¼ cup of batter into the hot pan while simultaneously tilting the pan to swirl the batter into an even layer. Cook for about 45 seconds, until the edges are slightly crisp and the bottom is lightly browned. Use a spatula to loosen the crepe, then flip it over with your fingers and cook on the second side for 20 seconds until it is lightly browned. Remove the finished crepes to a plate. Assemble the crepes. 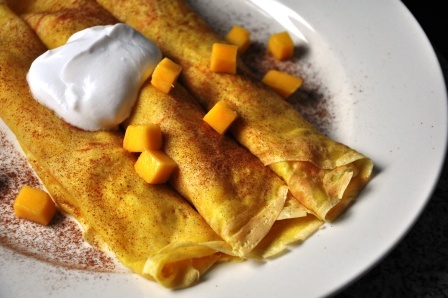 Mix the banana, mango, and ¼ cup coconut milk together, then spoon a couple tablespoons of the filling down the center of one crepe; roll the crepe up around the filling and repeat with the remaining filling and crepes. Sprinkle the crepes with cinnamon and top with the additional coconut milk. Ode to a crepe! I’m salivating. If only I’d seen your latest post earlier so I could have made this part of my Sunday morning. Discovered your blog a couple weeks ago, while looking for a Labneh recipe. Thanks for that. Hi Richard! Glad you found the blog and the labneh recipe. Hopefully you’ll find time to make the crepes soon, I would love to hear how they turn out. Thanks for reading! Love, love, love it! Keep blogging and I look forward to reading and tasting more. When I have a kitchen this may be the first thing I make! Yumm! @Richelle, hopefully that kitchen (and house) of yours will be done soon! So glad you’ve been enjoying the blog. Ah crepes! We were just looking at pictures from our epic French journey and thinking of you. What great meals we shared together, and all the more fun with your epicure’s perspective. 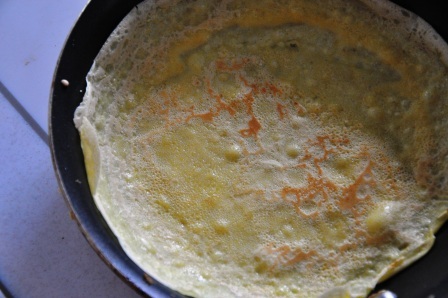 I love your tropical twist on the french classic crepe – will have to try this!